SHOE LAB NYC is a footwear technology and design company. 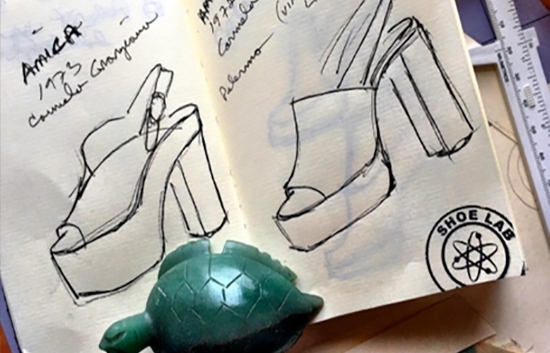 From sketch to shelf, mind to market, SHOE LAB NYC will help designers navigate the shoe development process. With the capability to rapidly produce prototypes, sales samples and small test run production, we enable the startup, as well as the established wholesale or retail customer, to speed to market, shorten the cycle time and gain a competitive edge. Our long-term mission is to help build domestic shoe factories and enable the creation of new businesses through the training and employment of creative, skilled workers, strengthening the shoe industry with new talent, compelling design and technological innovation. David Aaron Siskin is an entrepreneurial footwear brand building professional with forty plus years of extensive and successful shoe design experience, creating footwear brands, collaborating with RTW designers, brand owners and licensees of dress, casual and athletic footwear categories. With hands-on experience, Siskin is capable of taking on the responsibility for all phases of long and short term strategic planning, market research, designing, manufacturing and marketing branded and unbranded footwear. David has a thorough knowledge of shoemaking technology, leathers, materials and international sourcing. Siskin leads his team empowered with experience, working with an array of international manufacturers and vendors, maintaining excellent, cooperative relationships. · Partnered in and managed a New York City shoe factory and design studio while designing and building two new shoe brands. · Built, owned and operated a full service design studio with multiple clients addressing multiple markets and footwear categories, designing and producing branded and unbranded footwear. · Created, marketed and eventually sold a successful international footwear brand, DAVID AARON, and business, DIVA INTERNATIONAL, Spanish footwear design and sourcing agency, DESIGN STUDIO S.L., to a public corporation, STEVE MADDEN (SHOO). Speaks fluent Italian and Spanish.